Mr. McKinnon joined Unit 217 of the Army, Navy and Air Force Veterans in 1991 as an affiliate member and he is the Past President of the Dominion Command. 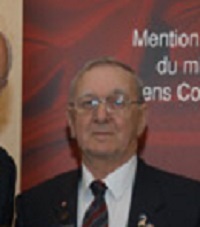 Mr. McKinnon is also the Past President of the Cape Breton Veterans Comfort Fund, where he and his wife deliver home-cooked meals to older Veterans and other Veterans in need. Mr. McKinnon spends many days a week visiting shut-in Veterans and those who reside at the two Veterans hospitals in the area. Mr. McKinnon assisted in a fundraising project to purchase a bus to transport local Veterans to and from appointments and events. Funds were also raised to purchase Christmas gifts for more than 200 Veterans. Although not a member, Mr. McKinnon also assists his local Royal Canadian Legion branch with its Poppy Campaign and other community services. Mr. McKinnon received the Queen's Golden Jubilee Medal for his tireless work on behalf of Veterans.